Easter greetings to you all… here’s an idea for lunch or dinner for you. Now, Caesar salad without the croutons?! C’est sacrilege, surely? But if you follow a low-carb diet, the concept of tearing up the rule book on food is one you embrace. I’m back from a terrific few days in the Scottish Borders (abbey-visiting a-plenty), and my favourite meals while there was a Chicken Caesar salad I had in the Townhouse in Melrose. Now that one did feature croutons, albeit small ones, but the dressing and the juicy chicken made it stick out. I decided to re-create it at home. Issue one—chicken breast, a dry and often flavour-free meat. Issue two—my husband hates anchovies and they’re are often added to the salad or at least the traditional dressing. To avoid dry chicken, I poached mine in chicken stock (I used two cubes) with a handful of sage and thyme added to the cooking liquor. And to make an anchovy-free dressing*, I found an American recipe online and adapted it. 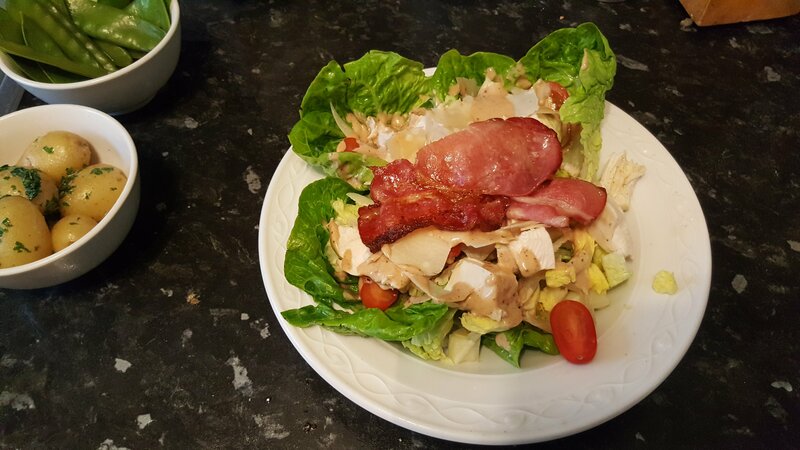 Here it is—crouton-free Chicken Caesar Salad suitable for low-carb and gluten-free diets. <em>A fresh, light recipe that is still filling and perfect for a late spring or summer dinner</em>. Steamed green beans to serve (and boiled new potatoes for your carb-lovers). Bring the chicken stock to a simmer and add the breasts. Depending on their thickness, they will take 10-15 minutes to cook, but you shouldn’t have any pink meat remaining. Meanwhile, wash the Little Gem lettuces and pull off the outer leaves. Use them to line a wide bowl so you have a ‘tray’ for your salad. Shred the rest of the leaves finely, slice the tomatoes and put in a bowl with the lettuce. Add the Parmesan shavings. Whisk together the dressing ingredients and toss the salad to coat it evenly with the dressing. Grill the bacon until crispy. Once the chicken is cooked, chop or slice it and add to the plate. Top with the grilled bacon (one and half slices each). About 5-7g carbs per serving. Please note—the dish is high in protein and protein can affect your blood sugar levels after a few hours. Test your blood glucose accordingly. Our book The Diabetes Diet outlines how to deal with the protein content in meals. *Ssh, don’t tell my husband one of the main ingredients in Worcestershire sauce is… you guessed it, anchovies. Here are some suggestions on how to use July’s bounty to create delicious, seasonal meals. Not great for November unless you live in Florida or the Caribean? Come back next year! Heat half the oil in a large pan and fry the chicken in batches, over a medium heat until golden. Set aside. Put the bacon in the same pan and fry gently to release its fat. Turn heat to medium, add the shallots and cook for 5 min, stirring occasionally, until both are lightly coloured. Remove the leaves from the tarragon and set aside. Sprinkle over flour and stir to absorb the juices. Cook for 1 min, then gradually add the white wine, stock, and tarragon stalks. Return chicken to pan, cover and simmer over a gentle heat for 45 min to 1 hr until chicken is cooked through. Remove chicken, bacon and shallots with a slotted spoon and keep warm. Discard tarragon stalks. Simmer sauce rapidly until reduced by half. Stir in the creme fraiche and tarragon leaves. Season to taste. Turn off the heat, then return the chicken, bacon and shallots to the pan. Serve with veg.